However, lately I've noticed it has started dropping leaves. The leaves were still green. Last week some of the leaves have started to curl inwards and dry, as well as some of the twigs. Any ideas what could be wrong? The soil is moist, the temperature of the room is ~23-25 C.
I would repot or fertilize with DynaGro's Foliage Pro and some Osmocyte. My guess would be either that it's already root-bound (they grow fast) or else perhaps overwatered/soil not adequately well-drained. Or it could have suffered an unexpected draft...that'll cause leaf drop, too. Pretty little tree...hope you get it turned around. I'd try repotting it into the next size pot. Also remove the existing fruit to allow for a little more growth to occur of stems and branches. The fruit is taking all the nutrients and energy at the expense of the plant that is lacking in adequate size (appears to be no growth at all). Some people try and avoid fruiting on their trees in the first few years to help with building longevity into the fruit trees. I would remove all the fruit as the plant looks strained. Trim all dead or dying branches and leaves. The plant is already stressed I would wait to re pot ittill it looks a little healthier. The purpose of repotting in a situation like this would be because the plant is stressed. It could be excessive root growth or a problem with the potting mix being too dense. I make my own potting mix because all the store bought ones I have tried have been way too dense and you end up with sludge at the bottom of the pot and a lack of good drainage. 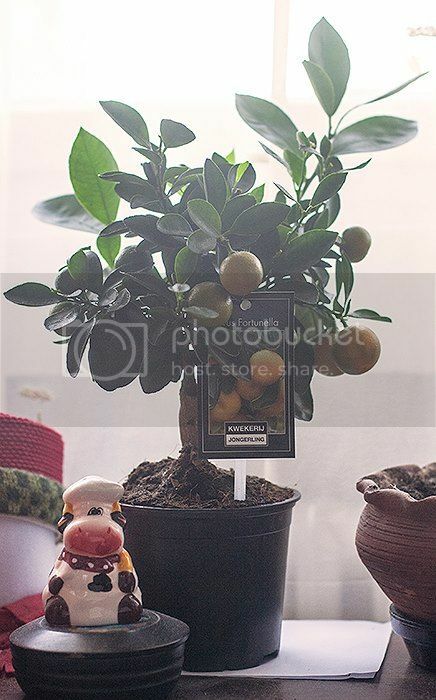 The plant is stressed and repotting would stress the plant a little more, but the benefits of repotting could potentially fix the problem, and the plant would continue to be stressed if it lived in its current pot. Does that make sense? 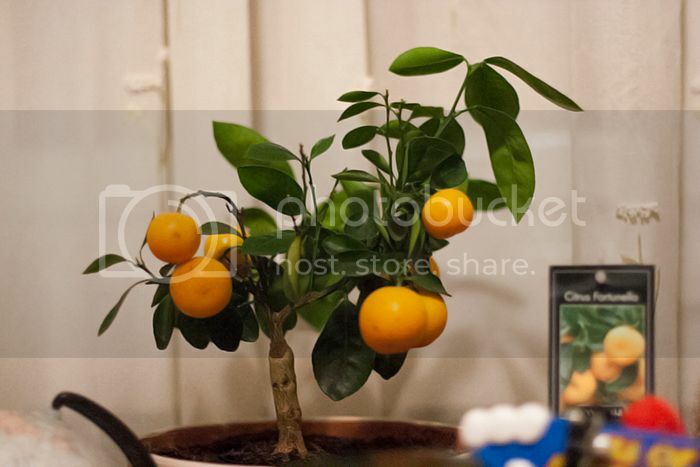 Besides removing the fruit and repotting, the dry indoor winter atmosphere may be the culprit. Try putting it in the shower and giving it a light shower of luke warm water. Be sure to removed any saucer underneath and let drain completely. I do this with poinsettias during the holiday season because of the forced hot air heat. What kind of light is it getting? I forgot to mention light, too. Houseplants will usually drop their leaves in winter due to a lack of light. You can get a UV light to compensate. I can't tell ya'll how much I enjoyed reading all these recommendations. And realistically, it's why I don't have plants!!! LOL!!! Thank you all for the suggestions. I wanted to wait till spring and plant some seeds but if it's going to help the tree I'll free it from its fruit now. I will repot it and buy a fertilizer. I just hope I'll find something similar to the one you have mentioned, doubledip. It would cost me 50$ for transport only if I buy it from Amazon, LOL! Not to mention possible customs charges since it's a chemical. That would be way to expensive for a fertilizer that costs 10$. With the warmer weather coming up and hopefully some sunshine (we're in the middle of a gloomy winter), I hope it will survive.